Hisashi Nogami in the E3 2014 announcement for Splatoon. 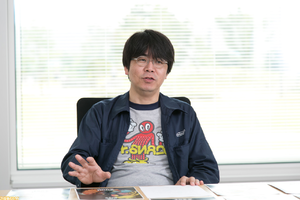 Hisashi Nogami is a Nintendo employee and producer for Splatoon and Splatoon 2. Nogami first thought of making the Inkling Characters in Splatoon. When giving presentations about the Splatoon series, and for promotional events, he often takes on the persona of a researcher at the fictional Squid Research Lab, by dressing in a white lab coat and dark sunglasses. As part of acting out this character he also makes squid-related puns by replacing/emphasizing the sound いか with its homophone イカ, "squid", most commonly イカがですか ("How are you?") and イカした ("It was lively / energetic"). Nogami, dressed as the "Squid Research Labs" representative, posing in front of the research vessel Yokosuka at JAMSTEC HQ. Nogami at the Yokosuka's helm. Nogami admiring a model of the CHIKYU. Nogami posing in front of the Shinkai 6500, the submarine that inspired the design of the Autobomb. Nogami at E3 2018, making the Octo Expansion "8" pose in front of a poster of the Expansion. Nogami admiring a model of the Splatoon design of the Splattershot. Nogami playing Super Smash Bros. Ultimate as the Inkling character on Moray Towers. This page was last edited on 6 April 2019, at 21:38.